Visions are seeing someone or something in a dream or trance, or a supernatural apparition. Vision is the ability to think about or plan the future with imagination or wisdom. 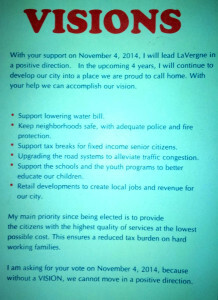 Having a vision – or in Alderman Waldron’s case “visions” – is really not that hard. The more difficult challenge is facing reality. Reality is an awfully pesky thing, especially when statements made during this mayoral campaign about past accomplishments are exaggerated. First, the water bill was not doubled. Sadly the alderman does not understand this, but instead perpetuates that untruth. The water rate was initially increased by 40 percent. So if you paid $10 previously, you now pay $14 for water. If the water rate was “doubled” as the confused alderman claims, the bill would be $20. The sewer rate did go up 60 percent. So the previous $10 bill would be $16. Still not double. Together, the bills would have previously been $20 and are now $30. That is – if you add it up and do the division – a 50% increase in all. Not double. When you do not have basic math skills, how can you be expected to manage a $14 million dollar city budget? The Alderman says he supports lowering the water bill. Well hot-diggity-dog, we ALL support lowering the water bill. Unfortunately, the city was bleeding money in the water and sewer fund – or operating in the negative because no incremental increases ever took place. When that happens to a municipality – any municipality – the state frowns upon it and slaps on the label “Distressed.” Like when schools are in distress, the state takes over. The state told the city, fix it or we will. 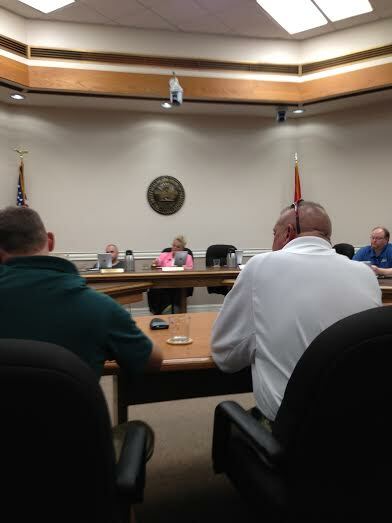 The city asked the Municipal Technical Advisory Service for an audit and they presented their findings. City officials then appeared before the Water and Wastewater Financing Board, which accepted the proposal but was concerned that the rates did not go up enough. Candidate Waldron also said he voted against the utility tax. The city does not have a utility tax, so we have no idea what this claim is about. Does he even know what he is talking about? Yes, taxes did increase three years ago. They went from 50 cents to 100 cents. It was necessary because the city was in a massive financial pickle. When Mayor Mosley took office in November of 2010, funding was so scarce that payroll almost couldn’t be met. Streets had not been paved in years, the crime rate was appalling, and four of the five board members of the previous administration locked the city into a contract with the privately funded fire department… a 10-year contract that the attorney advised against that provided the owner with a profit of more than $100,000 PER MONTH. And to rub salt in the wound, there was no way to fund the contract. That fire department contract – by the time it would reach its peak – would have accounted for at least 87 PERCENT of that tax increase (possibly more depending upon the consumer price index). So the Alderman voted YES on the fire contract, then turned around and voted NO on funding it. Speaking of his “no” votes, Alderman Waldron says he wants to keep neighborhoods safe with adequate police and fire protection. Yet he votes NO on every request of the police department and every request of the fire department. An operating 911 system? NO. Vehicles that don’t break down three times a shift? NO. Bullet proof vests? NO. Breathing apparatus? NO. He talks the talk, but when the rubber hits the road his campaign promises are empty. He says he supports schools- which are county funded and we have not seen him at any school events in our memory- and he supports children, yet he did not show up to one single day of the playground build, not even the ribbon cutting ceremony. He doesn’t show up to any of the LHS band events, and is not a known sponsor of any school extracurricular activities. Alderman Waldron states that he has completed all kinds of education, including certification from the state. Mayor Mosley also says she has completed an assortment of course work. We challenge BOTH candidates to prove it. Show us your transcripts or your certificates of completion. Because frankly, we believe one is not speaking the truth. Prove it. Additionally, in the past 4 years, he has not made or seconded one single motion. He has not presented a plan to fix anything or lower rates on anything. In fact, we wonder: his own Historical Preservation board- how many times has it met in the last three years? Twice. If he can’t even keep a board together to meet every time it is supposed to meet, how can we expect him to run a whole city? Yet through all of this and because of her leadership, crime is at its lowest rate in at least a decade, retail is coming, and the quality of life is improving. The city budget is now balanced and the credit rating has improved. Roads are now on a 10-year paving cycle. And our crumbling water and sewer lines are being replaced. The problems are being fixed steadily by professional staff that have been told to do their jobs legally, morally, and ethically. 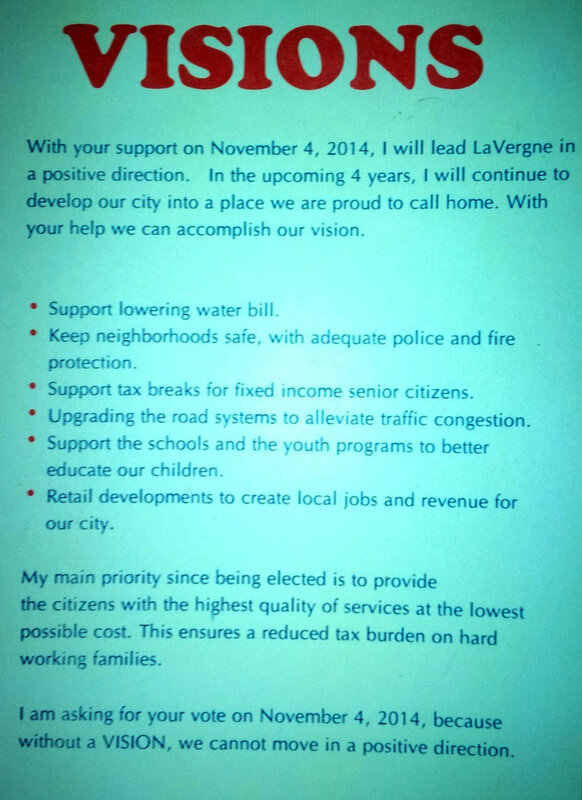 Alderman Waldron says that he wants to continue keeping LaVergne strong and moving forward. It sounds to us like he wants to ride on the coattails of something Mayor Mosley has already done. I have seen nothing as to how DW or MB would accomplish anything, all I have seen is how he voted with the citizens (of course he could vote no on everything because he knew he would be the only one) plus he then would turn around and vote to fund the very thing he had just voted against. And just what has he done the whole time he has been an alderman, the only thing I see is where he started some committee and from what I have read they don’t even meet, so what has he done in all this time to help move the city forward. And about the same with MB, I see her vision and statement about how she would vote based on incomes of the citizens, whose would that be the ones who have the largest incomes or the ones who have the lowest incomes and just how does she think the city can move forward that way, she speaks of the cable bills, true you don’t have to have cable however; electric bills, food, gas, insurances, automobiles, clothing, school supplies, just your everyday needs, how was she able to budget those increases into her personal budget? And not just her, all those who still are complaining about two items that were increased into their personal budgets, do they complain that much about the other things? A city cannot be run on visions and do you really just keep on fixing things that continue to break down, I truly hope you never have an emergency and one of those police cars or fire trucks that you simply had fixed breaks down on the way. 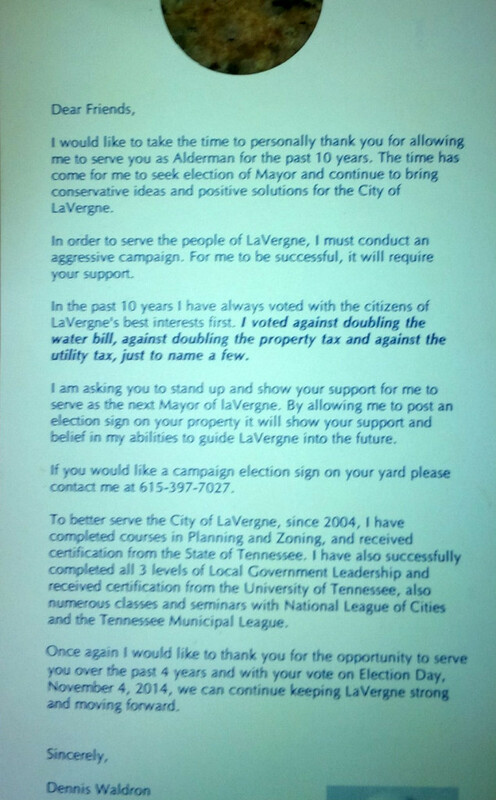 And one more question would be if you can’t attend city meetings now because of family if elected how will you then be able to attend? I truly hope you will come to this page and answer some questions as most of us have either been blocked from your supporters pages or can’t see very many comments.